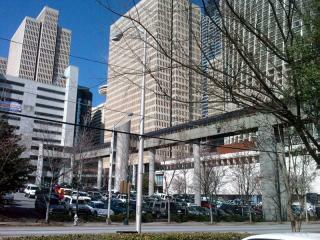 Despite my previous two posts, downtown Des Moines could really learn a thing or two from downtown Atlanta. 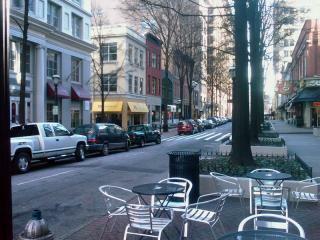 An entire mini-neighborhood of walkable, pedestrian-friendly streets remain in the older portions of the large downtown. I'm not a fan of the Des Moines skywalk system, but someone please forward this memo to the "At Least Des Moines Didn't Screw Up This Bad" department. I am in Atlanta for a conference, and have spent a couple afternoons (yes, after classes let out) exploring downtown Atlanta on foot. There is a clear line of demarcation between the older portion where the streets were built to accommodate pedestrians comfortably, and the "urban renewal" portion where the historic buildings have been systematically replaced with brutal high rises and the streets can best be described as pedestrian hell. The post 60's section has an extensive skywalk system, perhaps constructed as a response to the horrible street level pedestrian experience, perhaps a culprit. The most egregious example I found is pictured below. What you see here is a two city block long, six story high, six foot wide intestine that collects nutritious pedestrians from nearby hotels and parking garages, digests them, and then poops them out into the Mall at Peachtree Center. How Does the DM Library "Stack" Up? I make no secret about my opinion of the Des Moines Library Central Branch design. Despite its green bona fides, I think it is inappropriate for a public building to be so architecturally inaccessible. 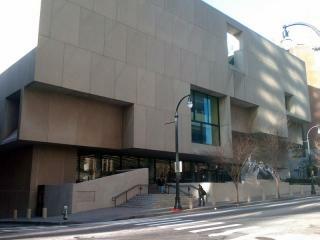 Enter the Atlanta Public Library downtown branch! I am in Atlanta for a conference (learning about the new EPA lead paint rules among other things - more on that later). After classes today, I went on a long walking tour of downtown Atlanta and stumbled upon Marcel Breuer's Bauhaus/brutalist older cousin to the Des Moines Public Library (designed by David Chipperfield).